Hello!! I hope this finds you well rested from a wonderful weekend! Have you been over to The Brakefast Club? The Brakefast Club is a free forum filled with friendship, Inspiration, Challenges , Fun, Contests, and ideas for I Brake For Stamps! This weeks challenge was to create something with GREEN! 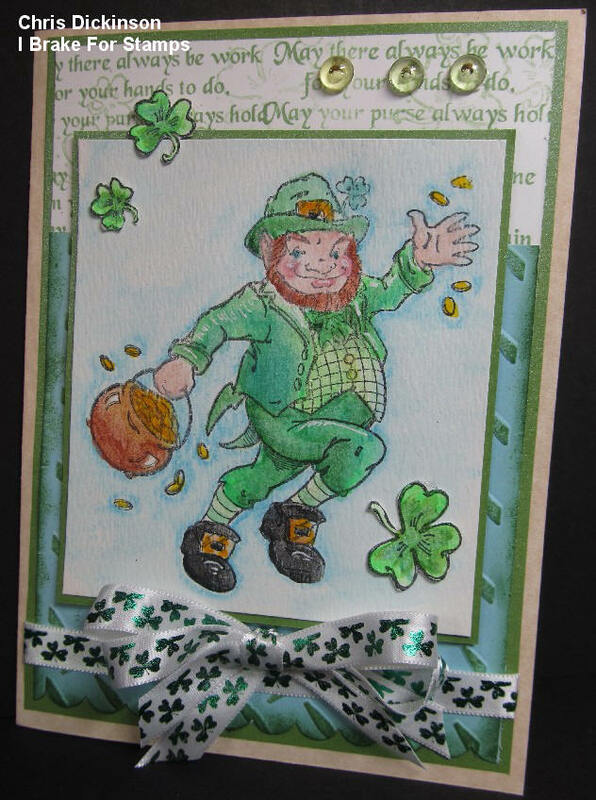 Todays card, I decided to try something and didn't get the colors I wanted, so I did some punting and came up with this creation. 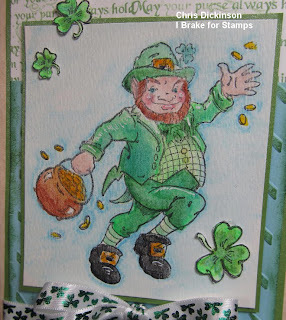 I started out by using Creative Inspiration Paints and the Spring Green paint on my water color card stock. I did not achieve the Bright Green I wanted, so I grabbed my water color crayons and mixed some Glorious Green in and WAH-LAH! I achieve the glorious, shimmery green I wanted!!! 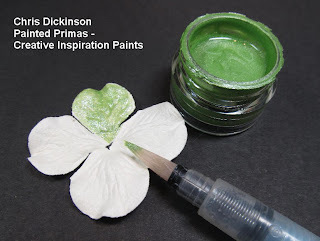 I Brake for Stamps now carries these wonderful paints too! 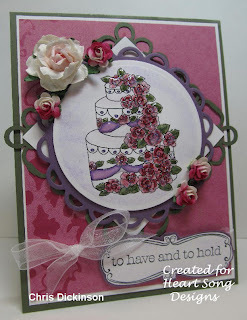 I also had fun using Paper Temptress Paper SO FUN!!! - Here are the gorgeous papers I used Water color Paper, Paper, POP Tones - Berrylicious, Antique Parchment brown, Metallics Fairway - Each of these papers has their own unique quality - each embosses beautifully and really help add the extra WOW to create a fabulous card! 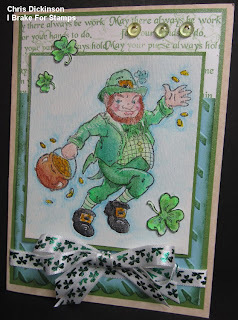 Happily Ever After Crafter #15 - Color challenge for St. Patricks Day! Thanks so much for stopping by! I hope you have a wonderful day!!! Hello! It is pre coffee as I write this so honestly after I wrote Hello my mind went blank. 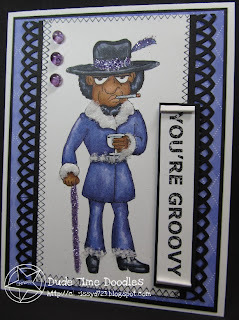 LOL I created this on Monday for the Splitcoast Stampers Color Challenge! You can see even more inspiration with these great images here. 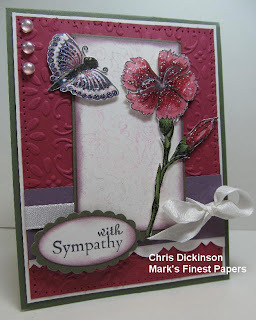 This is my week with LOTS of stamping deadlines! So I am working like a mad woman in my stamp room!!! LOL Thanks so much for stopping by! I hope you have a wonderful weekend! Hello Everyone, HAPPY Friday! I have a few projects that I am sharing with you today! The Bloggers Challenge will be on this post too, so scroll down please! 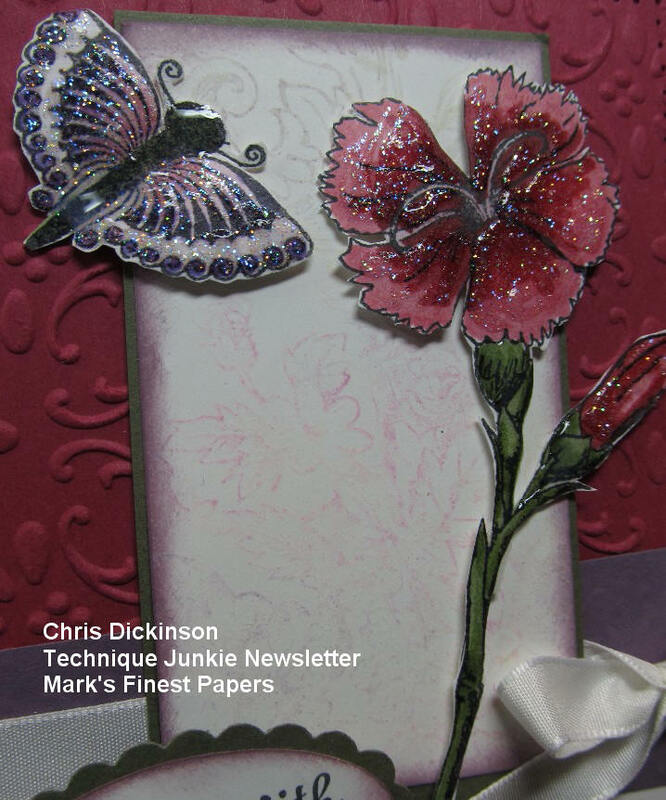 I am thrilled to be the Guest Designer for The Paper Temptress this month! They are having a Design Team Call right now - so go check them out - HERE, if you are interested. I have to say WOW! SOOooo many WONDERFUL papers in that store!!! 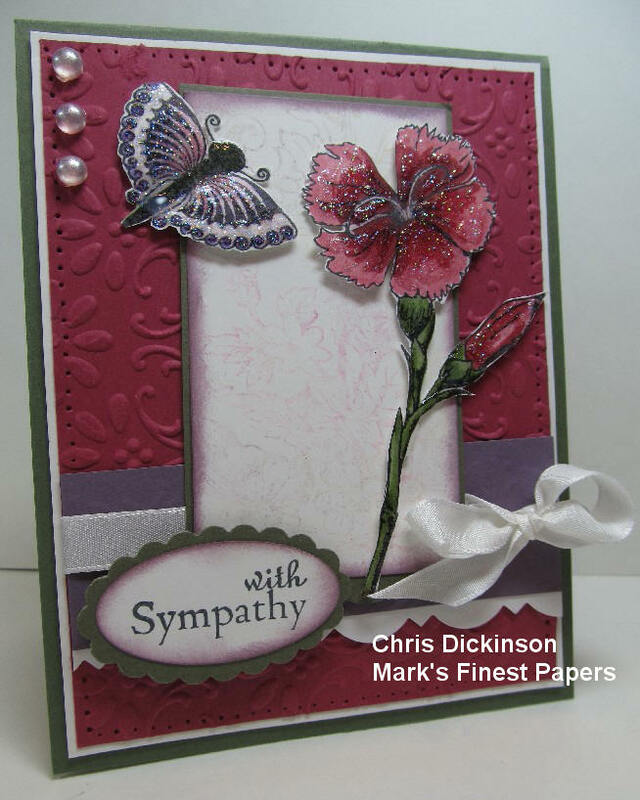 I have been ordering some papers here and there and sticking in my stash and have had fun pulling them out and playing with them this month. 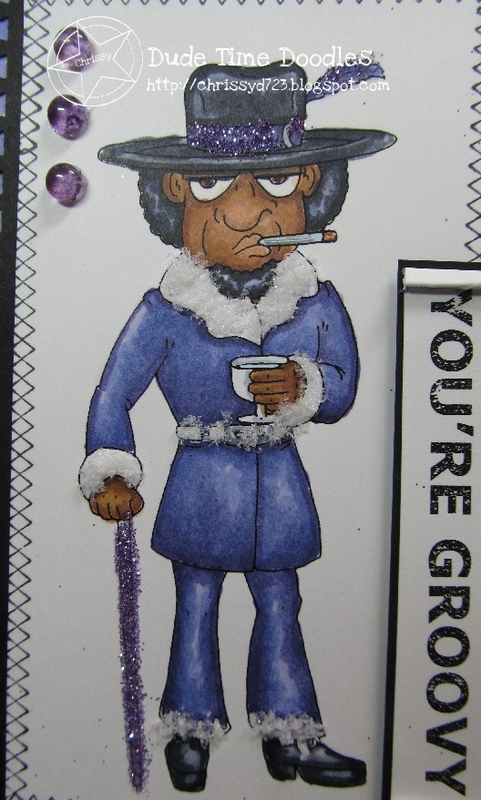 You have to FEEL this Black Velvet paper. Such glorious texture and it feels SO good in my fingers, I barely want to use it... But truthfully.... What good is this SCRUMPTIOUS paper if you do not USE IT!? If you USE it, it will bless not only YOU but someone else too! It is hard to SEE the velvet - but my oh my! Someone asked me the difference in this paper verses other papers - this is how I replied it is the TEXTURE and how it absorbs the ink and Ohhhh SOOO luscious and filled with SPLENDOR!!! I used the Technique Junkie Newsletter April/ May 2003 issue and the Split Negative technique..
Now, are you ready for the BLOGGERS CHALLENGE!? This week's Bloggers Challenge is a SKETCH! Last month, I messed up and made these two cards and look!!! I remembered I had created them! Yahoo! LOL I only remembered because I had a few people tell me they forgot, so I have been WATCHING for it! 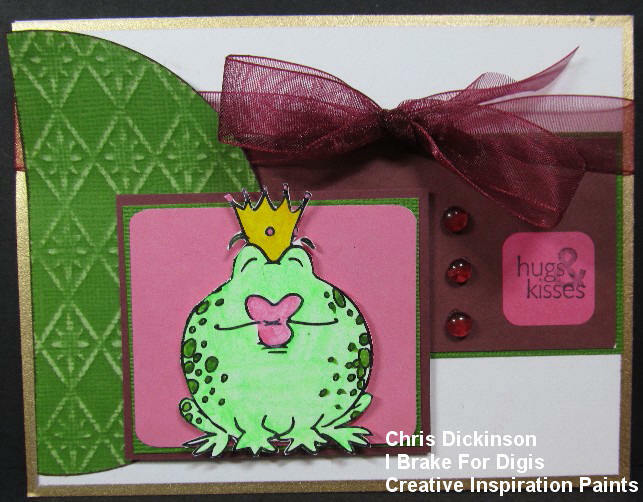 Stamps - I Brake for Digis Snowman! I used the Technique Junkie Newsletter and the Sanded Co'redinations technique. If you'd like to play along, please link back to THIS POST (On Lisa's Blog), mention you created your card for the Bloggers Challenge Embossing Challenge, and link your card below using the Link Tool. Just a note on the link tool, your link should be a direct link to your challenge post, please do not link to cards that were created prior to the challenge. Delightful Challenges- use your scraps (patterned papers on cards 2 and 3), Splitcoast Stampers Way to Use It Challenge- Use grey! Thank you for stopping by, looking and commenting! I hope you have a wonderful day!!! Hello Everyone- Happy Thursday!!! Remember a few years ago when the big rage in flower land was these paper Primas? Well, they keep coming out with BETTER product yet we have these left overs laying around. ACK, of course, I buy all of the new stuff too, but need to be a wise steward and use up my older things too. 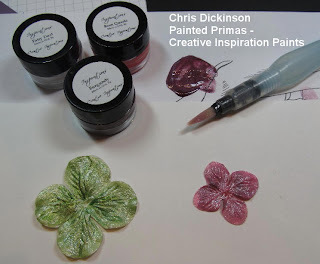 In an effort to do this, I grabbed my Shimmery, fabulous Creative Inspiration Paints and thought I would make some leaves and paint my Prima flowers too, to match my card! You can use any type of paint brush you wish! I used an Aquapainter. Choose your paint color and your Prima flower. I bought a large bin of white Primas, so I will be creating a leaf with this one! 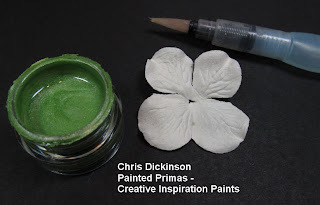 Paint directly on the flower with the paints that you like. Be careful to not over saturate with water as you paint. If you do, carefully use a Heat Tool to dry the flowers. I did not have the right color of rose, so I mixed my own color. 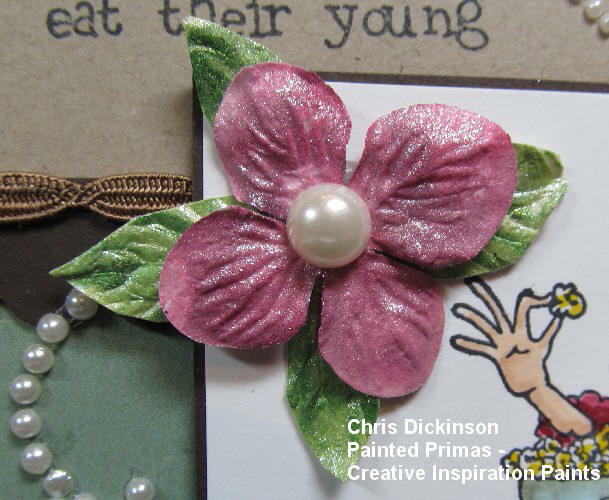 I used a touch of Burgundy, Rose and Fairy Frost and painted the color directly on the second Prima. 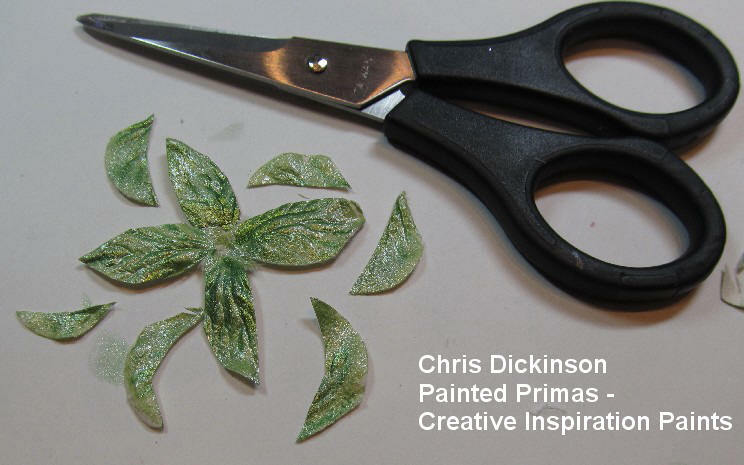 Once the paint is dry, I trimmed the Prima flower to create more of a "leafy" look. Don't you just love the shimmer with these paints??? Guess what!? 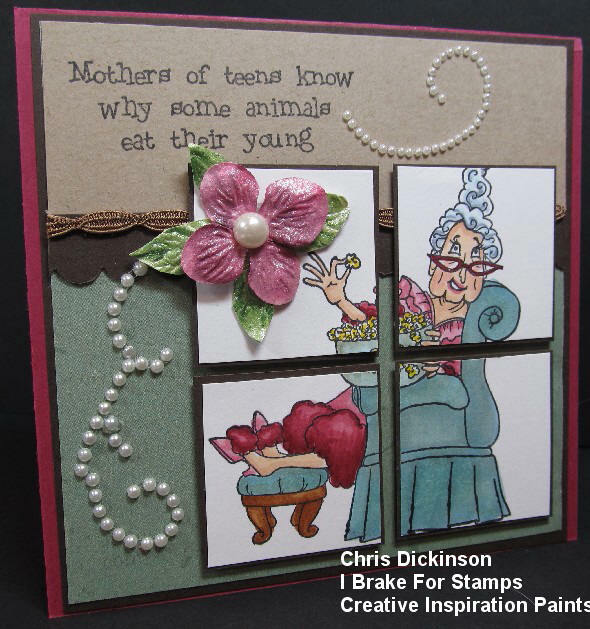 Creative Inspiration Paints are now available at I Brake for Stamps too! Thank you so much for stopping by! I hope you have a wonderful day!!! Be sure to check out the DUDE TIME DOODLE BLOG HOP HERE when you are done! Hello everyone- I have another post here to share with you today! First off, I am SO excited!!!! I taught myself to make my VERY first Blog Badge!! !For those of you who do not know, I consider myself Compu-Tarded, so this was quite the accomplishment for me! The broom image was a free image I found on a Google Search engine found HERE. 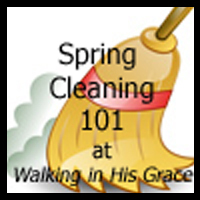 Check out Cyndi's Blog for some Inspiration and devotionals and her beautiful testimony! Now for my card today!!!! On this card, I used the Technique Junkie Newsletter April/ May 2010 Edition and the technique Background Burst Extension. This technique actually makes TWO backgrounds for you to design with! Thank you for stopping by! Have a wonderful week!!! HELLO Friends! 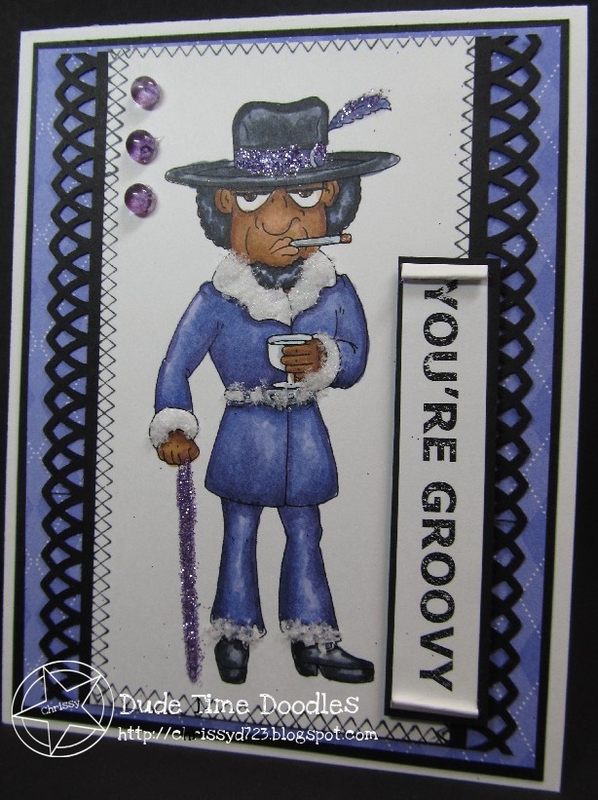 Are you feeling GROOVY!? Welcome to the Dude Time Doodles New Release Blog Hop! I am so glad you stopped by!!! You are in store for some FUN as you HOP through these new DUDELY Images! While you are hopping be sure to leave some love - one of the Design Team Members will be secretly chosen as the "MYSTERY HOSTESS" of the blog hop and one lucky commenter will receive one of our new release images for free or any individual image of their choice. We have six new images to share with you this month and as you hop along we're sure that there will be something that inspires you! To start the hop off in the right gear we bring you Down Town Delmar Disco. I thought I would bring you a smile with the fun saying... I used Microsoft Word and printed it up with my Digital image! I used the technique called Soft 'n Sparkly from the August/ September 2010 Technique Junkie Newsletter check it out!!! From here, you will want to HOP on over to the TAMMY'S BLOG next! GREETINGS FRIENDS! Have you checked out the HUMOROUS SENIORS over at I Brake For Stamps? These images are so fun and they will definitely make you SMILE! 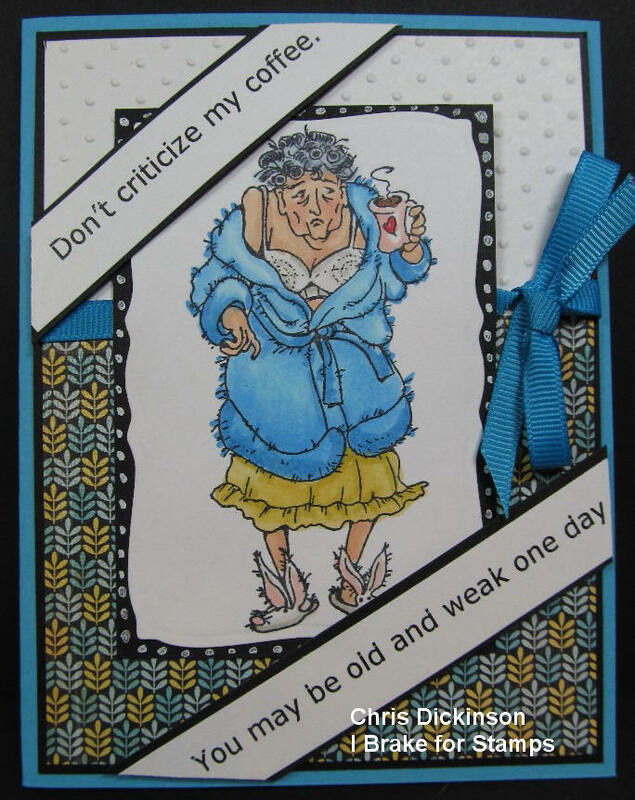 And isn't that what card making is all about? OK!!! I hope my mission was accomplished and you smiled while you stopped by! Thank you for stopping by and commenting! Please come by again! HEART SONG DESIGNS SUNDAY RELEASE! 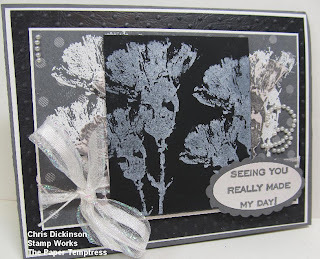 BLOGGERS CHALLENGE #200 EMBOSS ME! ODBDLYLS2 - THIS IS THE DAY - SCRAPBOOK! IT'S A DUDE TIME DOODLE SKETCH!